The TrustFire XML C8-T6 5-Mode CREE LED 1000 Lumen Flashlight is amazingly bright, small and, for less than $10, probably the best flashlight you can have on hand for any camping or survival situation. This flashlight is not loose in any of the threaded connections when wielding it. -- As in this flashlight does not rattle when I swing it like a lightsaber... FsssH VWOOOM VWOOM! Flashlight has a solid switch on the bottom which is covered by a textured green rubber cap. -- The switch also appears to be of good quality as there are no obvious deficiencies after mashing it for a while. For ~25 USD this is the best flashlight with Cree XM-L T6 LEDs out there. When it arrived the package was small enough to fit in my mailbox so I didn't have to muck with a 'Sorry we missed you' slip. This flashlight fits completely in my jeans front pocket. The inside of the glass on the flashlight had dust on it, so I had to unscrew the top and wipe it down with a lens cloth. Overseas shipping is slow (1 month for my order), but there aren't any manufacturers for this in the US so we're all stuck for now. WARNING: This next con is founded on hearsay from other reviews on Amazon only and I cannot back it up with my own experience. 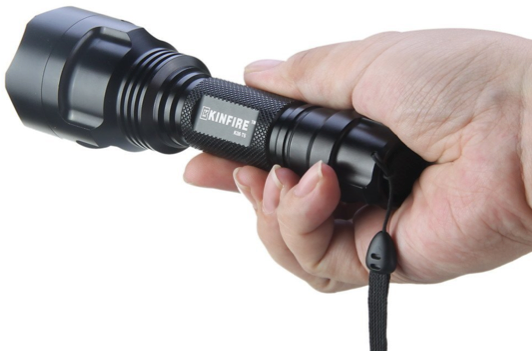 Many of the reviews here on Amazon that I have read for these Ultrafire flashlights have indicated that on HIGH output the flashlight will shut off after a short period of time (30 seconds to 3 minutes). This appears to be related to using cheap 18650 Ultrafire batteries as their protective circuit is either faulty or not rated for the load they are claiming the battery is capable of. With this in mind I decided to purchase the top of the line battery for use in this flashlight, which at the time of my purchase was the 3100mAh 3.7V 18650 Battery with IC Protection from EagleTac. The purchase of two batteries and a charger for them from that company actually cost me more than this flashlight (~33 USD), but on the flip side I have not had any problems with the flashlight cutting out while in HIGH output mode after a few minutes (and reliability in a flashlight when you need it is key). And again, your mileage may vary, and I cannot confirm from my personal experience the contents of this Con entry, but I wanted to put the summation of my research of these flashlight/battery combos out there in the event that it might help other people in some way. This is a great product and I will be getting more of them for friends and family, however, with the slow shipping time I will have to order them soon. And even though there are a few downsides in my post I still believe that this item deserves a 5 star review when put in the perspective of its price point.